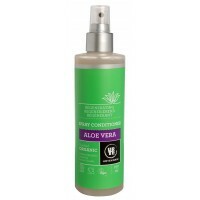 Urtekram Aloe Vera Spray Conditioner with Hydrolyzed Corn Starch and Sugar Beet Extract to improve the conditioning effect and protection against heat stress and color fading. Suitable for all hair types. Urtekram Aloe Vera Spray Conditioner with Hydrolyzed Corn Starch and Beet Root Extract to improve the conditioning effect and protection against heat stress and color fading. Helps detangle strands and keep hair smooth. Spray and leave in dry as well as wet hair and do not rinse. Suitable for all hair types. SHAKE BEFORE USE.